Obama also stated that 'we must never accept the premise that they put forward, because it is a lie.' This too is nonsense. A lie is a deliberate intention to deceive, and these self-described jihadis are  at least by their own understanding  speaking the absolute truth when they claim to speak for Islam. 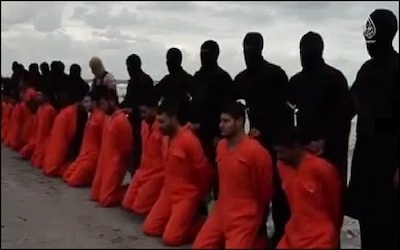 The Egyptian government reacted angrily to the executions, bombing Islamic State positions inside Libya. Egypt was incensed about this massacre  and rightly so  but it has a very long and enduring track record of not prosecuting Muslims who have massacred Christians within its own borders. General Al-Sisi is a leader who has been complicit in this peculiar form of Muslim cowardice. This moral inconsistency is causing great division and confusion among Copts at the present time. There is a double standard in the house of Islam. Examples are legion. The Jordanian royal house has been prominent in speaking up against attacks against Christians in Iraq and Syria, yet at the time when the Common Word letter was being released to the Christian world in 2008 under Jordanian royal sponsorship, its own Royal Aal Al-Bayt Institute for Islamic Thought had posted on its website fatwas by its Chief Scholar  the former Mufti of Jordan  which declared death for Christians for the crime of leaving Islam, and even identified one person by name (see here). Last week the Islamic State's 'Hacking Division' released the names and addresses of one hundred US military personnel. It urged the 'brothers residing in America'  i.e. American Muslims  to 'deal with' them, which is to say, it wants them killed. The second quoted verse, from Sura 9:14, puts forward a view concerning what Muslims should do about emotional pain and anguish they may experience because of unbelievers. 'Allah', the verse says, 'will heal the breasts' of Muslims,  and then the sentence continues into the next verse  'and remove the rage of their hearts'. This is a most significant statement. It is saying that if a Muslim kills a non-Muslim, they cannot both end up in hell. The alternative to hell is paradise, so in other words, killing a non-Muslim  who is destined for hell due to their unbelief  can provide a sure ticket to paradise for a Muslim. the fundamental problem is that the majority of otherwise peaceful and law-abiding Muslims are unwilling to acknowledge, much less to repudiate, the theological warrant for intolerance and violence embedded in their own religious texts. we in the West need to challenge and debate the very substance of Islamic thought and practice. We need to hold Islam accountable for the acts of its most violent adherents and to demand that it reform or disavow the key beliefs that are used to justify those acts. Hirsi Ali was right: the West needs to engage with and repudiate the Islamic dogmas that killing or being killed in murderous attacks against non-Muslims is some kind of golden key which unlocks the gates of paradise. Until these beliefs and the canonical teachings they rely on are acknowledged and repudiated, the lives of non-Muslims will continue to be discarded as the 'ticket to paradise' of Muslim belligerents.